Choose this format, example : Sunday, 28 February 2009. Toplinks contain home, RSS, contact link element. Remember to back up all image to your own imagehosting. Appreciate to theme designer by not removing credit footer. He spent lot of time to make it free for you. Hope you can respect it. Pass 4 Sure CompTIA A+ exam online CBT and updated 350-030 dumps are kind of tools that can perform very well for you in CompTIA A+ final exam. You need to use lsat prep courses study materials in a right way and spend time with them to gain complete understanding of the actual exam course. gre practice test study tools can let you find your preparation easy and effective for the final exam prep. For the achievement of best quality gre study guide, only Test King Study tools are recommended by many people. Updated 640-822 engine are most remarkable helping materials which you can use easily for the final exam prep. sudah seperti biasa DUA JEMPOL KE ATAS !!!!! just visiting u my friend and your nice template. I started reading.......... lol. hitam.... two thumbs up Bong..... good job. Something is wrong with the date - it displays as "Undefined" can you suggest a fix? First of all, thank you for this. A few questions if you don't mind. One, why does my website (http://bredforwar.blogspot.com/) seem to load correctly in Firefox but not internet explorer, two how do I find out my rss feed, third, how do I get rid of the text under the header (I am still crediting the author on the bottom of the page at all times), and fourth what do I put where it says to insert my email, I did that and all it does is give me a bad page (you can click it if you want). I hate to hit a person with all these questions but I finally just made the transition from Wordpress to Blogger. So far I like it but I am still getting my feet wet. Any help would be greatly appreciated. Thanks again. Thanks for the fast response. Best help I have seen, and it was free. Thanks again. Not quite sure still what I am supposed to be looking for on that webpage. Only thing I saw of similarity to here was the same theme with an option for wordpress. I would use wordpress if that is what you are asking but I am led to believe they charge for customization of that level. I meant the hosting it's self costs. I had gone to wordpress and it seems if I use anything beyond the provided themes then I gotta pay a fee. That is not a big deal for me though, it was never something I expect to get around. I am fine with blogger, just got to get used to it. I hope you don't mind one more question. Is it possible to make the description text have a background alpha. Don't feel obligated to answer, it seems I have already taken quite a bit of your time. @vonus:never mind, i like to discuss :) I have another blog using wordpress, its hosting costs, but wordpress have a lot of great free template :) Am still learning how to. What do you mean about background alpha? I meant how behind the text that reads "Member of the WarhammerAlliance.com WCPI." there is a black bar. Instead I would like just the text colored and the black bar to be gone. You honestly got me considering though just dropping the blogger and paying for a wordpress blog. If you don't mind me asking, who do you pay for your hosting? I just find wordpress is so much easier to use. Blogger also does not have some of it's features. I pay $8 for domain and $20 for hosting , a year. Hosting is depend on your bandwidth need, cheapest hosting is about $9, of course with less capacity and bandwidth. Thanks. Worked like a charm. You seem very lucky. I have not bought hosting before but it seems the cheapest I can find for simply hosting a blog is around $5 a month but they make me sign up for several years at once. Thanks again for the help. I will make sure to send people back to your blogs way. hello friend I have a problem with the blog. im using firefox. ok, will try removing widgets. i've removed every widget in the original layout. what's left is the header. When I replace the template with the XML you made, it asks if i would want to delete the widget Header. I confirm and Save. Then the same error happens. It works on Preview though. cebong: try click at 'older post' see on the page there is comment picture and also footer post disappear. cebong, i was able to use it. i removed all widgets in the XML you made. I just replaced it when i installed the template. thank you! @ome: great..glad to see it works..
Is there a way to change the font as the current one looks a bit ragged. I love the fact that you continually help people with the use of your templates! Yours is the first one that I actually put onto my site that worked - and the instructions were easy to follow. I actually like Wordpress better than blogger, but wordpress is way too much drama and not very user friendly. Question, though - if you look at my page: http://pearlswindow.com, you'll see that the "read more" link is there, however, it shows up at the end of the post, which defeats the purpose. I'd like to have a certain amount of text show in addition to the pictures and videos on the main page while if more than say... anything more than 600 characters will be followed by the "read more" link. I tried changing the numbers in the HTML code provided, but it still shows the entire post and shows the "read more" link at the bottom, but by the time you actually GET to the read more link - there is nothing left to read. Kok saya template yang saya pakai readmore nya kadang2 berfungsi kadang2 tidak? Dan Footer nya gak biza dibagi 3? btw kalo ga ada headerna gimana? @fakely: msti nambah header sendiri :D ya dihapus aja.. I am using this theme and the header_bg is not showing up. I find no graphic now when I use the page. Recommend hoting images on picasa or some other free image host. Don't rely on template creators to host images for you. While the large majority will be fine, if one goes offline or just deletes their template, yours is gone. Thanks buddy i finished with the issue.. This is a great template. Do you have a 3-column version of this? The time stamp format worked fine for the June posts, but the month is not showing up for my July posts. Any suggestions on how to fix this problem? I have the timestamp set up as you have specified in the instructions. Cebong Ipiet: That fixed it perfectly!!! Thank you soooo very much for your help and super fast response! I LOVE this blog layout! My Blog is in spanish and I can't find the format's date that you gave us... I think that is becaouse it's a blog in spanish and not in English, so? What can I do? Can u help me? Jeje that was the problem I thought that was the FORMAT DATE :) but now is Ok... Thank u!!! Hey! Thanks a lot for the template, it's beautiful! Some idea to edit the "Blak Magik" image at the top of the template? sis... template nya keren² semua, sampai bingung mau pkae yang mana. akhirnya pakai yang ini deh. sis, klo mau bikin postingan tapi yang paten enggak bisa tertumpuk dengan postingan lain nya bila aku bikin postingan baru. soalnya aku batesin 3 postingan yang muncul. dan klo mau nambahin tanggal gmn ya sis coding nya. gmn yaaa... masukin beberapa gambar dalam satu postingan tp beberapa gambar itu tertata rapih. 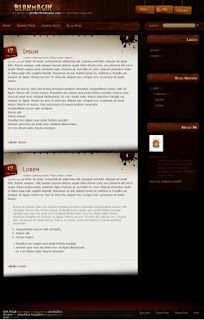 ow iya sis, aku ada nambahin html untuk status YM, tp kok enggga ada efek nya yaaa? di Blog tetep Offline, padahal YM ku sudah online. bagian Recomanded Product... mau aku tambahin di blog ku sis. sudah di copas tp mala error. gambar nya engga mau keluar dan navigasi nya engga mau jalan. trus biar agak naik ke atas gmn sis... maksudnya penempatannya di bagian posting. There seems to be an issue with the positions of the comment images while viewing the template in IE. They're slightly higher than if you're viewing it in Firefox, or another browser. Also, while viewing in IE, you'll notice that the "Labels" section of the last post on the page is not connected to the post itself. There's a good gap between the two. Hi again. Is there any way you could help me with the IE issues I pointed out earlier, please? Here's some screenshots I have taken to elaborate a little more. Thanks for the response. I downloaded the template from btemplates.com. Is the one above an updated version? Done. Everything seems to be in order now. Thanks for making such an exquisite template. When I host the images myself there seems to be a problem with the "header_bg.jpg" image. Is there a way I can change the link color of this template? I'm all for keeping the credits in the footer, but I don't want it appearing as the blog's description when people search for it on Google. 9 Oct 2009 ... Stuck Indoors Blak Magik is Designed by productive dreams for smashing magazine Bloggerized by Ipiet © 2009 ..."
That's what appears on Google when I type in the name of my blog. How is this changed? I have a question.. when i add a gadget above the posts on the main coulum... it has a bad brown background.. i want it to look like the posts.. is this possible? Hi there, love the template, but having a problem with the Comment links. They show up on the first page of my blog but when you click on older posts link at the bottom and go to the next page the comment links at the top are gone so is the ink blot. You then have to actually click on the title of the post to open that post on it's own page then it will allow you to access comments at the bottom of the entry! So how can a get the little "ink blot" image and the comment link to carry over to every other page after the first? ^ Thanks! That did it! I have another question. When I create a poll in blogger the options are not visible because the font is black and the sidebar background is black. Anyway I can change the poll font to white? Or even change the poll background to white? Nice template.. I've uploaded it but the brown colour of the background doesn't come up.. I'm on IE 8 by the way..
Screen shot below shows my background colour missing. Hey cebong.. Thx for the quick reply.. I still cant seem to figure out the problem from all the answers mentioned above.. I've tried to visit TheAnswerMVP2001's blog and I see the same problem.. Could it be something to do with IE ? There's got to be someway to at least change the poll background color, otherwise people who have black backgrounds can't use the poll feature! Nevermind I figured out how to change the background color of the poll. Just need to add background-color:white to the widget code and it changed it! Hi, I've a question. Pictures in entries always appear behind the right-layout, I mean a big image shows its part which equals to width of main layout, the remainder of this picture is hidden behind a right-layout. To to make images appear front? Sorry, maybe it's a bit hard to understand what I said. You can see that the picture is behind the right-layout and hidden its part. The picture should be in front of the right-layout, although this picture covers some texts in the right-layout, but it doesn't matter. What part of HTML code should I change? Please tell me if you know. Thanks a lot for the help. It's true, the background color isn't showing up in any version of IE, it looks nice in Firefox, but in IE the background is white. Still not working in IE? Now all pictures show in front of the right-layout, not be hidden anymore w/out being re-sized. I finally got running in IE8. Anyway I could push the body and the sidebar further to the right and duplicate the right sidebar on the left so I have sidebars on both sides with the body right in the middle? May I know why the "searching" function is not working at the blog? Is it need to input any code? Thanks! Hello, thank you for thí template. Can you tell me why there is "undefined" of each post and how to adjust the header "Loạn Thế Phồn Hoa" to the left corner of the blog or the same position like "Blakmagik" of your blog? O, well. I finally knew why now. Sorry for bothering you. Hello I just downloaded and installed this theme on my blogger account today. I love the design but have a few problems with the blog post. There are two areas for blog posts. The top blog post is fine design wise but the quick edit does not work on it. The second blog post the ink blot shows up at the bottom left of the page, does not display the author, and has no datestamp. You can see this at my blog or on the screen shot below. I've have several posts yet it shows a duplicate at the bottom that I can not remove. Also when I open the post it shows two on the post page rather than one. Can you let me know what I need to change to fix this? Three women who work in Gucci Bracelet the same office notice that their female boss has started leaving work early every day, so one day they decide that after she leaves, they'll take off early, too. After all, she never calls or comes back, so how is she to know? The brunette is thrilled to get home early. She does a little gardening, watches a movie and then goes to bed early. The redhead is Links Bracelet elated to be able to get in a quick workout at her health club before meeting a dinner date. The blonde is also very happy to be home early, but as she goes upstairs she hears noises coming wholesale Links jewelry from her bedroom. She quietly opens the door a crack and is mortified to see her husband in bed with HER BOSS! Ever so gently, she closes the door and creeps out of her house. The next day the brunette and redhead talk about leaving early again, but when they ask the blonde if she wants to leave early also, she exclaims,"NO WAY! I almost got caught yesterday!" A beautiful trollbeads jewellery, multi-color composition trollbeads beads of beautiful silver jewellery, so beautiful, brilliant, the look trollbeads bracelet, even more beautiful, trollbead charms has always been the same. It was just nice information sharing and its helpful for everyone. I really trying for my blog thanks for the upload.